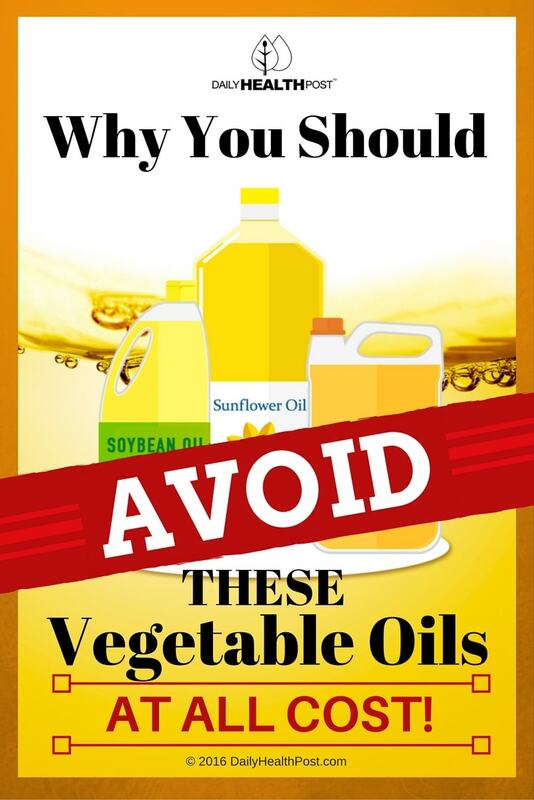 Why You Should Avoid THESE Vegetable Oils At All Cost! Why do you think it’s important to avoid fried foods? You may guess that it has something to do with salt or fat content, but the truth is a little more complicated than that. The danger of fried food isn’t just about the oil that soaks into fried food, it also about the fumes the oil creates while cooking. Not all fried foods are prone to this problem, as the main variable that goes into the health value of fried foods is what oil they’re cooked in. Vegetable oils are highly unstable, meaning that they can release harmful chemicals, like aldehyde, when heated or exposed to oxygen. These chemicals act as neurotoxins and carcinogens (1). Regular household use of canola, sunflower, corn, safflower, grapeseed, rice bran and soybean oils is enough to create these substances. Reusing the oil dramatically increases the quantity of these chemicals. Researchers who studied the oils could only measure the DNA-damaging chemicals in the oil, but many of the chemicals escape into the air, where they are breathed in by you and your family members. It’s believed that these chemicals may be contributing to the high lung cancer rates in countries that use seed oils for frying. The Daily Mail reports that just 20 minutes of cooking with vegetable oil produces 20 times the permitted levels of aldehyde recommended as a maximum limit by the World Health Organization (2). The “smoke point” of oils serves as an indication of the temperature at which oils begin to produce toxic substance and beneficial compounds start to degrade. Simply put, the lower the smoke point, the more dangerous the oil as the more quickly it will start producing harmful chemicals when heated at high temperatures. Some healthier oils, like coconut oil and flaxseed oil, have lower smoke points than their unhealthy counterparts, like soybean oil and canola oil. To examine the full extent of aldehyde production, one study collected samples of used sunflower oil, vegetable oil, corn oil, cold-pressed rapeseed oil, olive oil (refined and extra virgin), butter, goose fat, and lard. Samples were then sent to De Montfort University in Leicester, where Martin Grootveld, professor of bio-analytical chemistry and chemical pathology, began analyzing their contents (3). “We found that oils which were polyunsaturated-rich – corn oil and sunflower oil – generated very high levels of aldehydes,” Professor Grootveld told the Daily Mail. “Sunflower and corn oil are fine [to use in the kitchen], but only as long as you don’t subject them to heat, such as frying or cooking,”. “It’s a simple chemical fact that something which is thought to be healthy for us is converted into something that is unhealthy at frying temperatures.” He explains. The study discovered two previously unknown aldehydes in these samples. Known aldehydes were also discovered to be much more toxic that previously thought. 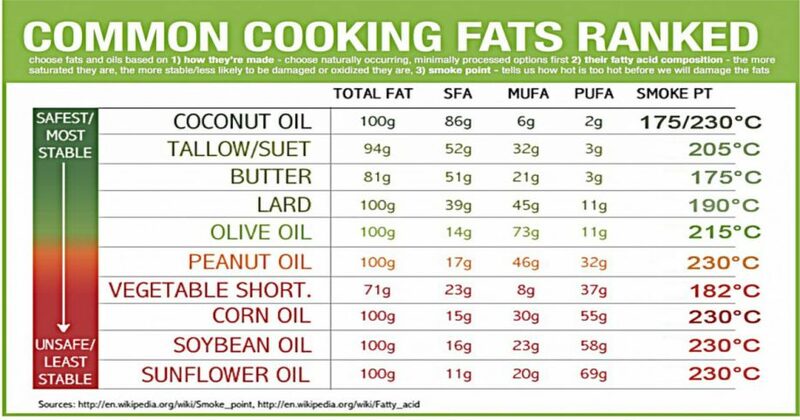 Olive oil, butter, and goose fat produced fewer aldehydes when heated, possibly due to their higher levels of monounsaturated and saturated fats, which are much more stable when heated than other fats. 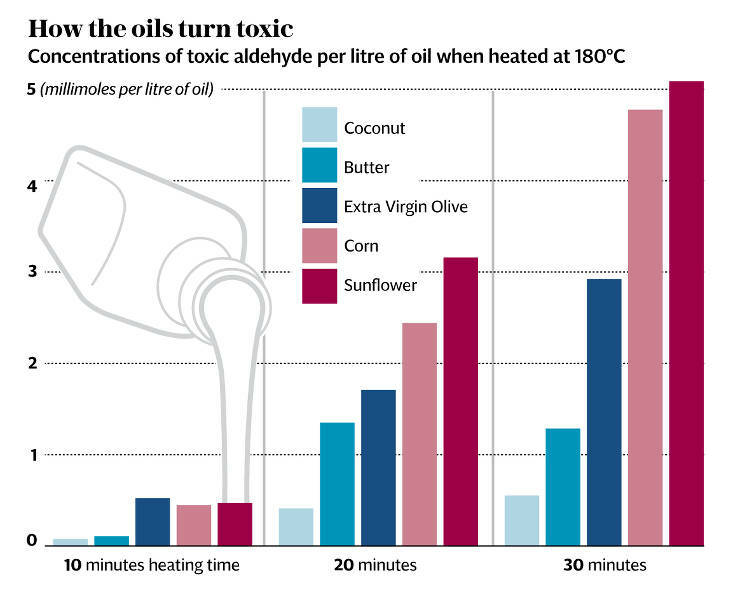 In fact, three times more aldehydes were produced when heating corn oil and sunflower oil than butter. Heat isn’t the only way aldehydes are forms, sunlight can have the same effects over time, which is why healthy oils like coconut oil, olive oil, and avocado oil should be stored in opaque bottles and placed in a dark, cool place. Not only is Canola oil highly unstable in high temperatures, it’s also massively GMO. Canola oil actually goes by the name of rapeseed oil, coming from a plant that is a hybrid of black mustard, leaf mustard, and turnip rapeseed (4). Genetically modified since 1995, 90% of Canadian-made canola oil is now certified GMO (5). It’s also partially hydrogenated, meaning that the oil was heated anywhere from five hundred to one thousand degrees under several atmospheres of pressure before being introduced to a catalyst like nickel, platinum or even aluminum to change its structure and density (6). This process also turns Omega-3 fatty acids into trans fatty acids (7). Like other partially hydrogenated vegetable oil, canola oil poses a severe risk to kidney, liver, cardiovascular, and neurological health. Its widespread use isn’t due to its safety or health properties, but rather because it’s cheap and easy to produce. It’s typically used in highly processed foods, cosmetics, inks, soaps, biofuels and even insecticides. Professor John Stein, Oxford’s emeritus professor of neuroscience, believes that the increased use of these oils is taking a toll on our brains due to their high levels of omega 6 acids, which replace critical anti-inflammatory omega 3 fatty acids: “the human brain is changing [due to the widespread use of these oils] in a way that is as serious as climate change threatens to be”. Other health conditions linked to the use of these oils include heart disease, cancer, malformations during pregnancy, inflammation, ulcers and a rise in blood pressure. Instead of cheap vegetable oil and corn oil, experts recommend the use of coconut oil, olive oil, organic butter, and red palm fruit oil. For high-temperature frying, Avocado oil can be used as it has an incredibly high smoke point (8). Latest Headlines » Nutrition » Why You Should Avoid THESE Vegetable Oils At All Cost!